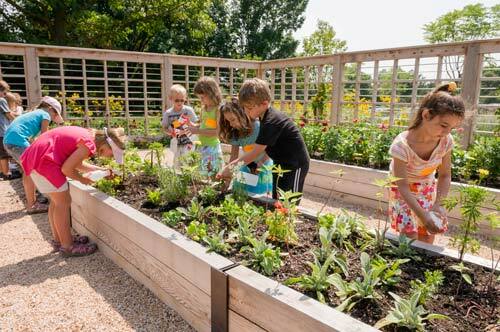 The Robert R. McCormick Foundation Plaza and entry drive serve as the gateway to the Regenstein Learning Campus—an emerging, national center of excellence in gardening and environmental science education for students of every age. Completed in 2011, the plaza and drive received funding from the Robert R. McCormick Foundation, U.S. Department of Transportation Federal Highway Administration, and Illinois Department of Commerce and Economic Opportunity. Together, the plaza and drive form a portal to the Grunsfeld Children's Growing Garden, the Kleinman Family Cove, and the Learning Center. Each year, nearly 200,000 visitors arrive here including participants in school field trips, Camp CBG, scout programs, teacher professional development workshops, family programs, and other classes. The site accommodates hundreds of school buses and other vehicles each year. 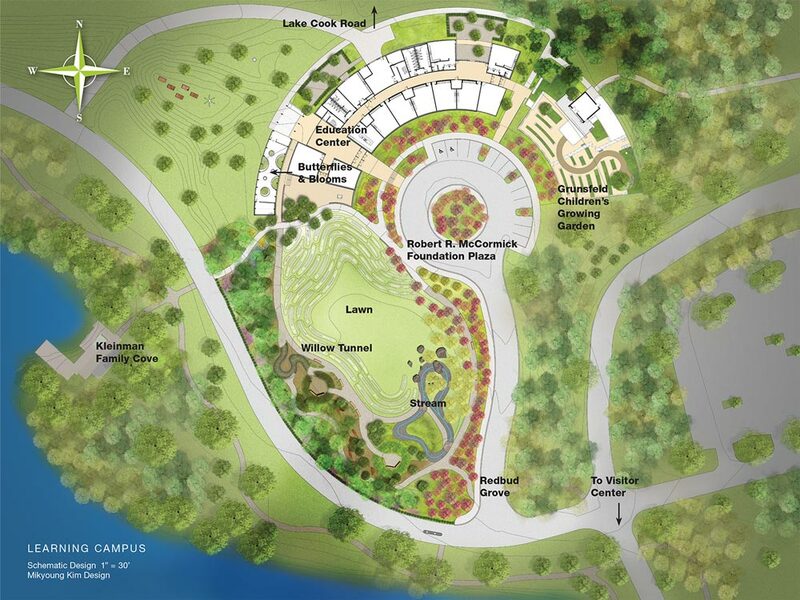 The paved drive curves into the sustainably designed campus, offering a view of the white-mesh enclosure of the Butterflies & Blooms exhibition to the west, the plantings of the Children's Growing Garden to the northeast, and compelling outdoor classrooms of the Learning Center to the northwest. A large, circular planting bed sits in the center of a circle turn, inspiring the senses with plants of many colors, shapes, and textures. Direct drop-off is available in this location, as well as parking spots including an accessible space for special-needs visitors. 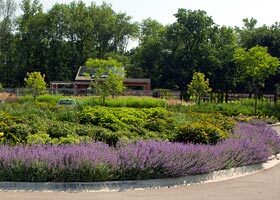 Adjacent, planted pathways allow visitors to move from the parking lot to the Campus and into additional areas of the Chicago Botanic Garden. Funding for the Robert R. McCormick Foundation Plaza and entry drive was provided by the Robert R. McCormick Foundation and the U.S. Department of Transportation, Federal Highway Administration. The paved drive curves into the sustainably designed Campus, offering a view of the white-mesh enclosure of the Butterflies & Blooms exhibition to the west, the plantings of the Children's Growing Garden to the northeast, and compelling outdoor classrooms of the Learning Center to the northwest. A large circular planting bed sits in the center of a circle turn, inspiring the senses with plants of many colors, shapes, and textures. Click here to view a large-scale plan of the Learning Campus.